Eagle County local Scotty Stoughton navigates one of the more than 100 rapids which he experienced on a standup paddleboard trip through the Grand Canyon with fellow standup paddleboarder Javier Placer. 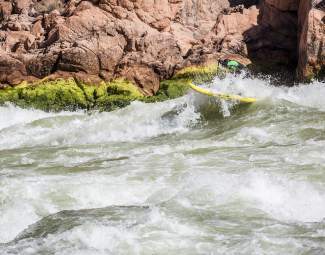 • 7 p.m. to 9 p.m.
EAGLE COUNTY — When Javier Placer kayaked the Grand Canyon in 2006, it was supposed to be his farewell from whitewater sports. Instead, it turned out to be the beginning of an odyssey that came full circle this spring, a decade later, in the Grand Canyon once again. The journey really began in 2002, when Placer taught a young man named KC Chambers the sport of whitewater rafting. “I spent a lot of time sleeping on his couch during those days,” Chambers said of Placer. When the opportunity arose to repay the favor, Chambers did so with what would be — for many — a once in a lifetime opportunity. Chambers spent the last decade on the waiting list to run the Grand and learned in 2015 that he would get the chance, in April of 2016. He texted Placer to ask him if he would join. In 2006, Placer was planning on hanging up his dry suit, for good. He had a one-year-old daughter and life was getting complex. Plus, he had attained one of his bucket-list goals in kayaking the Grand. Like the rivers he was so fond of, however, life was about to take some dramatic turns. Around this same time, standup paddleboarding was making its way off the lakes and oceans and into the rivers. Placer was enjoying winters in Maui, but in the summers, he wanted to be back on the rivers in the emerging new sport of whitewater SUP. Placer started Stand Up Paddle Colorado with business partner and friend Scotty Stoughton, and the company began running trips down the Colorado River in Eagle County. Being on that river got Placer thinking about its majesty, and more and more he found himself thinking back to being on the Colorado in the Grand Canyon on his kayak. “When I started paddleboarding on rivers, I knew it was only a matter of time before someone attempted the Grand,” he said. In 2008, legendary Hawaiian waterman Archie Kalepa attained what Placer knew was possible, completing a 187-mile journey through the Grand Canyon on a standup paddleboard. Back on Maui, Placer reached out to Kalepa by phone several years later in 2015. “It turns out that my daughter was in the same school as his,” Placer said. Kalepa took the call, and the two began to chat. Chambers had all but lost contact with Placer at that point. But he was able to track town Placer’s number and get that fateful text out. Chambers offered Placer another invite and Placer reached out to his partner in business and SUP, Scotty Stoughton. Stoughton said he knew it was something he had to do, he cleared his calendar and the group was set — Placer, Stoughton, Chambers, Eagle County photographer Zach Mahone and 8 other paddlers were to realize their dreams on the waters of the Grand. Placer and Stoughton were the only standup paddleboarders in the group. For Placer and Stoughton, swimming became a means of survival early on in the trip. The same was not supposed to be true for the rafters, but on day 2 of the 21-day trip, a group flipped their boat and were forced to pick up the pieces of their lost belongings and right their raft back to safety. Stoughton lost a camera to the carnage, which was something Mahone did not want to see happen to him. “I took a more active role in the navigation of the most challenging rapids after that,” Mahone said. In the end the group made it 280 miles through the Grand Canyon on the Colorado — among the longest Grand Canyon runs Placer has ever heard of for a standup paddleboarder — through more than 100 rapids, hail storms, rain storms and 30-40 mph head winds. Mahone came back with some beautiful photographs, camera in tact. In addition to those photos the group brought home a collection of amazing stories, lessons learned and even a few songs which they will share on Thursday at the 10th Mountain Whiskey Tasting Room in Vail Village at 7 p.m. The presentation is free for all to attend.